There can be little doubt that childhood is an exciting and wonderful time. It is filled with a variety of fresh and new experiences which are approached with a childlike innocence. Be that as it may, such youthful exuberance can be quickly tested as children are by no means immune to the tragedies and hardships of life. Considering all of this...do they have the actual knowledge or real life experiences to confront such challenges in an effective and logical manner? 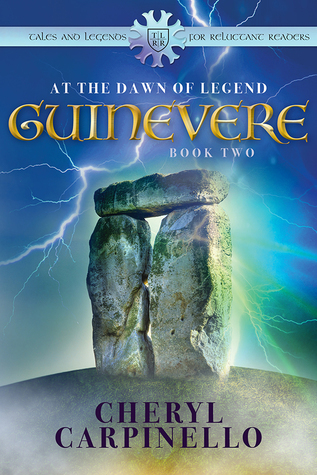 If these questions have piqued your interest, then Guinevere: At the Dawn of Legend by author Cheryl Carpinello, is an ideal reading selection. It is a piece of children's historical fiction which explores such notions while incorporating the setting of the Arthurian legends. Ideal for reluctant middle-grade readers who need to have their attention captured by a fast-paced story which is full of excitement and adventure. Set in a time of warfare, the story follows the escapades of the young Princess Guinevere and her friend Cedwyn. After leaving Cadbury Castle on a poorly conceived trip to visit the mysterious standing stones, both are forewarned of great danger by the Goddess of the Stones. However, it may be too late to rectify as events have already been set in motion and a ruthless group of renegades is intent upon capturing the princess. Unfortunately, both her father, King Leodegrace, and her betrothed, King Arthur, have gone away to fight in battle. It is up to young Cedwyn to protect the princess and truly reveal his mettle. Sadly, their impulsive nature quickly catches up to them as those they turn to for help are abruptly killed. Even worse, Cadbury Castle itself is ransacked and all the children are stolen by the renegades to be sold into slavery. Guinevere and Cedwyn vow to save the children. Do they really have what it takes to pull off such a feat? Can two fresh-eyed youngsters really outwit a band of cunning and ruthless renegades? I found the plot of this story to be quite exciting and engaging. It was written with reluctant readers in mind and as such it quickly travels from one adventure to the next in an effort to keep the reader actively invested in the story. There are also a number of themes in the novel such as loyalty and friendship, as well as taking responsibility for one's own decisions. These are key concepts for all people, but particularly for younger readers. While the plot was certainly exciting and engaging, I did find a few gaps. For instance, even though it takes place during a time of warfare, Cadbury Castle would not be left undefended. It is highly unlikely a small band of renegades would be able to overtake it quite so easily. That being said, the book is primarily action based and does not spend an exorbitant amount of time on explanations. In regards to character development, there are two main protagonists who are developed in sufficient depth. Guinevere comes across as a strong female presence who attempts to help others despite facing very cumbersome obstacles. She reveals herself to be a very "human" princess who is susceptible to making mistakes and then having the strength of character to try and remedy them. Cedric is also developed in detail throughout the story. He comes across as very "childlike" at the beginning of the tale. Nevertheless, by the end we can see the beginning of his emergence into a man who may just have his coveted Knighthood awaiting him in the future. Overall, I found this to be a very good book which will appeal to its intended reader base. It has a strong plot and well developed characters. It also very capably illustrates how difficult life could be during this era. An important point when writing a piece of children's historical fiction! Sign into Goodreads to see if any of your friends have read Guinevere.